Westward bound on the Oregon Trail, Lorena Emerson is alone after her uncle is killed. 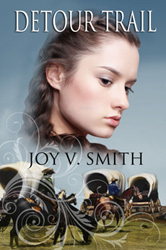 Ignoring the wagon master's advice to go home, she rounds up others needing help, and they join a later wagon train, but down the trail, they leave that train; she's forging her own path again. And then she rescues Barrett Lee--with Gray Cloud's help. After this man from the wilderness recovers, he and the wolf leave--with a nudge from Lorrie. Will he return? Will these two independent people make room for each other? Westerns are back--sounds like a good one. Hi, Joy, Stopped by to take a look at your new book. Detour Trail sounds like a great read. The title sounds like a good fit. Looks more interesting than your average western! Mary, thanks! I'm glad you liked the title. It started out as a working title, but then I thought: it works. Jenny, thank you! Purr, purr. Joy..just noticed I forgot to post to Barnes & Noble and Powells. If there is anywhere else you would like me to post my review then let me know. Your book is a five star book.